Originally published by Libcom. Written by Ergosum. In 2016 there were 2.29 million people in US prisons which is equivalent to 716 per 100 000 of the population. This is one of the highest rates of incarceration in the world. (In England and Wales the equivalent number is 144 per 100 000 of the population.) 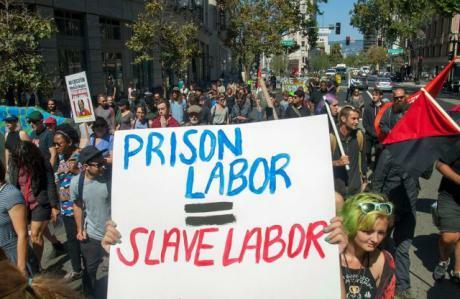 The vast majority of prisoners in the US are working class, and a disproportionate number of them are African-Americans and Hispanics. In states like Virginia and Oklahoma one in every 15 African American men6 is put in prison. This is no accident since these groups predominantly come from some of the most deprived parts of towns and cities in the US. It is also no accident that the US bourgeoisie has been deliberately targeting these groups by passing draconian sentences on them in order to fill up the prisons. This policy accelerated in 1994 with the introduction of the “three-strikes law.”7These laws require a person guilty of committing both a severe violent felony and two other previous convictions to serve a mandatory life sentence in prison. In California, these convictions can even be minor and a prisoner is sentenced for life. McDonald’s uses prison labour to produce frozen foods and process beef for patties. Workers flipping burgers and frying French fries for minimum wage at McDonald’s restaurants wear uniforms that were manufactured by prison labourers. Prisoners also process bread, milk and chicken products for McDonald’s. McDonald’s rival Wendy’s has also been identified as relying on prison labour to reduce its cost of operations.